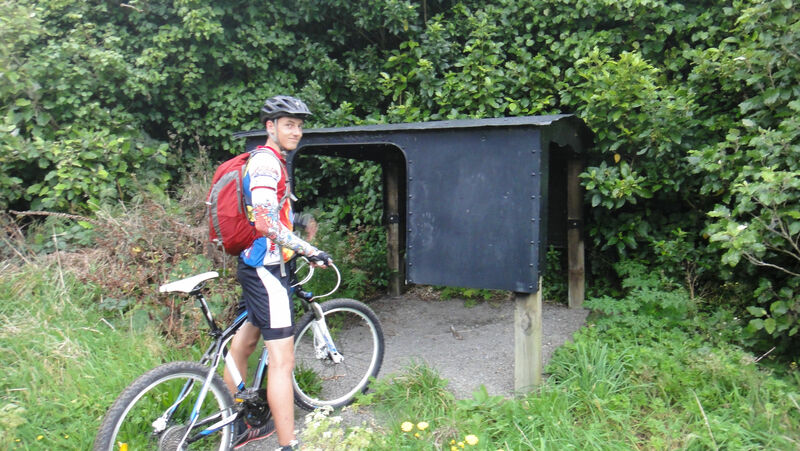 The Rimutaka Incline is an iconic piece if kiwi engineering which winds its way up and then down the valley linking Wellington with the Wairarapa. The track from the Featherstone end had to rise up a one in fifteen gradient and usually needed two or three engines working together to get the train up the hill. The track was specially designed with a central rail and horizontal wheels to help with grip up the hill. 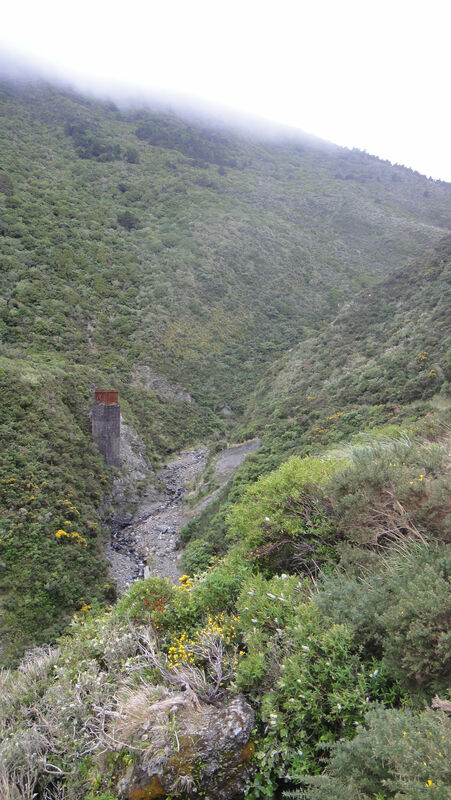 The Wellington side from Kaitoke was a much gentler gradient and ordinary engines were used. At the summit station the engines swapped over. The line has now been replaced with a more direct line through a tunnel and has been developed as an 18km (one way) walking and cycling track. Classified as a family friendly grade 1 to 2 track we decided it would be a good chance to get Nigel out on his bike! 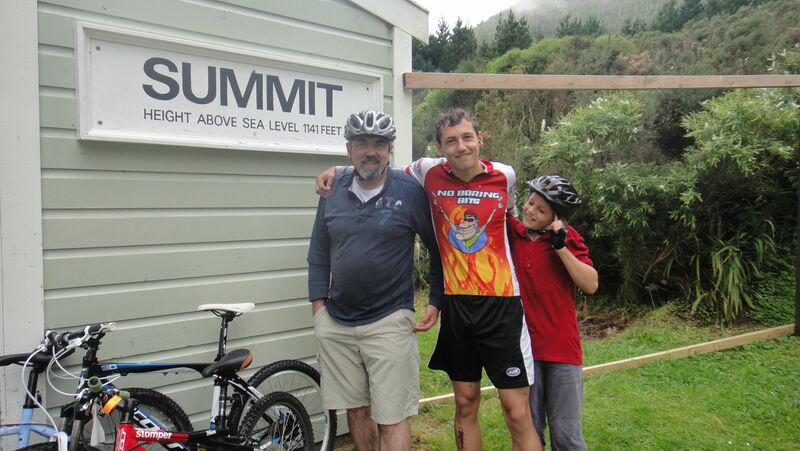 We spent all week in the Wairarapa working out how we could manage to cycle over without having to drive over the Rimutakas twice as well and decided in the end that we couldn’t! We could, of course have ridden there and back but felt that 36km might be too much (at least for Gus and Nigel!!) Having done the trip over the hill 3 days out of the four we had already been there and were planning on doing it again on the last day we were keen not to have to negotiate the windy road up and over the Rimutakas again if we could help it. So we decided that we would go from the Featherstone end, see how far we got and then ride back. We had clearly waited for the end of the good weather before we decided to attack it – after 4 days of beautiful sunshine we awoke to a cloudy, mizzly sort of a day. However, it wasn’t forecast to rain until late afternoon and the next day was destined for heavy rain so we went for it! 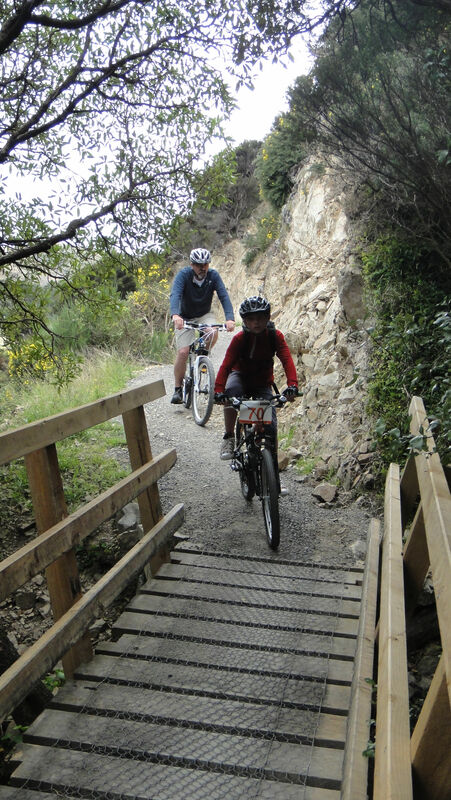 The first part of the ride rises steadily along a gravelled track with a hillside on your left and the valley on your right. 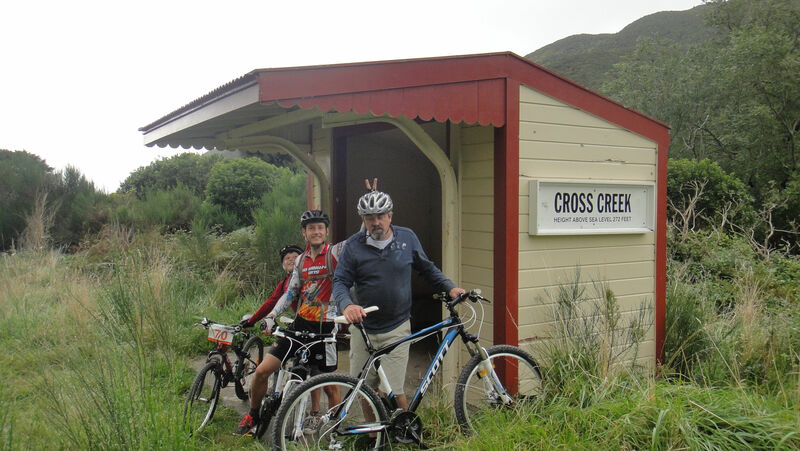 We rode through some open bush, crossed streams until we came to Cross Creek. This was the village which marked the end of the steep section and where the Fell engines would be swapped for ordinary engines. We stood and tried to imagine how the place would have looked with trains spewing their steam, and chugging through the station, the noise and the hubbub of coalmen shovelling coal into the engines, guards blowing whistles, passengers climbing on and off trains, the children playing and the inhabitants of Cross Creek going about their normal daily business. Once a bustling village that had a school, a swimming pool, tennis courts and bars, it is now overgrown with bush and there is little evidence of habitation. We did spot the concrete area that had been the tennis courts and there are also remnants of the engine sidings and the turntable. A small station shelter marks the place that was once a hub of activity and now that all that has gone, nature is reclaiming and it is calm and peaceful. We turn left up the valley and the real climb begins; there are information boards along the way that afford some respite from the unrelenting incline and we gladly stopped to read them. There was just enough information – bite-sized chunks that were easy to read and told you what you wanted to know! Lachlan left us in his wake as he sped up the hill but he waited at each marker. It was a good family ride in as much as we could all ride at our own pace but there was no togetherness about it! On that sort of gradient you just need to find your rhythm and go with it. The track wound up and following the valley gradually crossing the contours of the hill. When your eyes are fixed on the bit of ground in front of you as you push the pedals round, glancing occasionally at the next milestone ahead of you willing it to get closer, you don’t feel like you are making much progress. However, looking back down the valley at each marker made us realise just how far we had come. 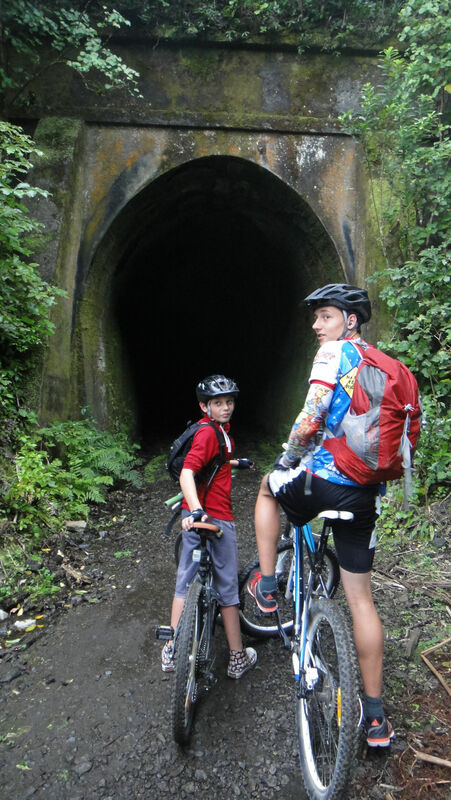 We soon came to the first tunnel and cycled in to the dark with a little trepidation. We had forgotten to bring any lights but the documentation we had read about the route said that you didn’t really need any! Fortunately a few yards in you can see around the bend and the tunnel is short enough that the light from each mouth is enough to make out the ground once your eyes get used to the darkness. Nevertheless it was a bit eerie! When we came out the other side we read that the tunnel was named Price’s Tunnel after a manager on the rail contract and that two workers had been killed when the roof caved in during construction of the tunnel. Life in the 1800s was tough and it brought to mind the number of workers who had died during the construction of the Ribblehead Viaduct on the famous Settle-Carlisle railway that spans the valley in a beautiful curve. Many people maintained that it was impossible to build a viaduct on a curve; it was achieved but not without the loss of around a hundred navvies who worked on it. Anyway, we continued onwards and upwards, and as we rode the hills and features appeared and disappeared as the mist swirled around. Siberia Gully seemed very well named by the time we reached it; bleak and grey in the mist! Apparently it used to be known as Horseshoe Gully because of its shape but the workers soon renamed it Siberia because of the bleak wind that blew through it. There used to be a bridge spanning the gully but all that remains today is the concrete drainage tower that diverted the stream. It was the scene of the only fatal accident in the history of the railway when on “11th September 1880 a gust of wind hit a train broadside pitching three carriages over the embankment.” Four children died and several other adults were injured. Since the railway closed in the 1950s the floods have washed the retaining wall and the bridge away. It was the only place on the ride that we were forced to dismount to climb down the steep gully side into the stream and then make our way back up again. The uninviting sounding Siberia Tunnel awaited us – it is 109 metres long and with a gradient of 1:13 it is the steepest of the sections on the Incline. No problem here except that going uphill in the dark is a little unnerving, but as in the previous tunnel there was just enough light for us to see where we were going. We were making steady progress, in fact probably faster than the trains used to do it! Apparently the engines took, on average around 45 minutes to an hour to climb the incline, slow enough for people to jump off the train pick some daisies and jump back on again as it came round the bend! Not far to go now though – we were heading for the Top of the World and then the Summit! But first we had to negotiate the Summit tunnel, all 580 metres of it. That’s more than half a kilometre in the dark! Just as well we didn’t get to see the information markers before we went in! At first glance it seemed like it would be easier because we could see the end – a dead straight tunnel despite the slight rise and then fall that the hump in the middle suggested. This was not to be the case; Lachlan hung back not wanting to lead the way, in fact we all hesitated at the entrance until I decided that one of us had to go first! The problem was that as I rode further into the tunnel the brightness of the light at the end of it effectively blinded me completely and I could see absolutely nothing in front of me or on either side. Aonghas shrieked as we went through, in fact we all made quite a lot of noises as we negotiated little dips and bumps. Only Nigel was silent at the back. I had no idea where the walls were or where the floor was which is very unbalancing, I couldn’t work out whether I was going in a straight line or whether I was going to crash into the wall of the tunnel at any moment! I concentrated on looking straight ahead and hoping that there were no holes in the floor or obstacles that could send me flying headlong. Eventually I got closer to the end and the natural light was enough to illuminate the ground and the walls, my confidence started to return and I increased my pace happy to be out the other side, the boys actually overtook me once they could see too, racing past me and abandoning Nigel in the middle of the tunnel on his own! I went back in to accompany him out and after that it was only a short ride to the Summit Station. Nowadays the summit station has a wonderful feel about it; by the time we arrived the sun was out and we were above the mist so the place seemed peaceful and quite appealing. We spent a good half an hour wandering around looking at the rusting hulks of engines that remain, imagining the corroded pipes and fireboxes red hot with burning coal and generating steam to drive them along the railway. The hills encircle the plateau and in the late summer sun it we thought it would have been a fantastic place to live but then we looked again and thought about how it must be when the cold southerly wind is blowing, the sun is not shining and the sky is grey. In the days of the railway the once heavily vegetated hillsides were devastated by the ash and half burnt coals that the engines spewed out. Fires were frequent and the forests burned down. Pictures of the landscape in the late 1800s and early 1900s show bleak, empty hillsides, denuded of the natural flora that had existed hitherto. Over the last 70 yrs the vegetation has regenerated somewhat and scrub and low lying shrubs have invaded so it is difficult to imagine what it would have looked like when the summit station was busy with traffic and the daily comings and goings of its inhabitants. Eventually, and maybe a little reluctantly as I think we were all rather unsure about going back into the tunnel, we set off on our return journey. The tunnel actually didn’t seem so bad on the way back although Aonghas did manage to cycle into the wall, and then the fun began. The benefit of climbing a hill is the return journey and this was a good one – 6 or 7 km of downhill which we did more or less non-stop! It was a bit rattly on the old arms and I had to keep shifting my feet and alternating which foot was at the front and which was behind as my muscles started to burn (standing on the pedals is advised unless you want a very sore bum!) but it was exhilarating and far easier than going up! Lachlan made it all the way down in about 10 minutes and we were not far behind! We were back down into the mist and the temperature had certainly dropped but that didn’t stop us exploring a little bit at Cross Creek before the final leg back to the car park. What a great afternoon, definitely fun for all the family and I didn’t even have sore legs the next day! Long time no write – we have been just a tad busy over the last few weeks, but now most of the boxes are unpacked, and the house is in some semblance of order, I thought I’d take some time out to write an update. well as the garden table and chairs and it is very pleasant sitting out there even quite late into the evening. The garden is very pretty and well laid out and the sitting areas are sheltered and quiet. When Blair was out here over Christmas he tidied up the straggly bushes and deadheaded the roses for us, but really there is little to do to the garden except keep it tidy. We have plans of course – there are several Camellias and lots of roses as well as some beautiful ornamental grasses and other shrubs and trees we don’t know the names of – but we would like to create a vegetable plot and swap some of the ornamental trees for fruit trees. However, we will see how things grow over the next 12 months before we start decimating the place! Inside I am revelling in having an en suite bathroom – no more queues for the shower in the morning and a toilet seat that is down not up!! (you need to have a family of boys to appreciate that one!) But generally just having space to move around and finally unpack all those boxes is great. on the plane as there was no sign of him. After a couple of anxious hours and some unproductive phone calls to the airport and the airline we realised that due to the time difference he must have got the day wrong. Fortunately the Shuttle service was up at the airport the next day and picked him up for us! He spent last Christmas helping us pack up the house in Ingleton and this year helping us unpack in Hamilton, hopefully next time he visits we won’t be moving again! We headed down to Greytown on the Friday Aonghas finished school – Lachlan had already had a week off by this stage, mooching around with his friends. A quick stop in Taupo for a late lunch/early tea and then straight on down. Next day we went over to Wellington for a family get together. Mike and Kathryn – Nigel’s cousin and his wife were over from Malaysia where Mike is working at the moment but were due to return the next day. It was good to meet up with them again and Aonghas enjoyed playing with Alexia whilst Lachlan looked on with a sort of teenage superiority! We spent the next few days between Greytown and Wellington – Aonghas was desperate to go to Te Papa again and we all had last minute Christmas shopping to do. On Tuesday we went out to Matiu/Soames Island which is a former quarantine island used by the European settlers when they arrived in NZ in the 19th century. Sadly, some of them never made it off the island to discover the delights of the new life they had left Europe for. It is a beautiful place and DOC (The Department of Conservation) have adopted it as an Island Sanctuary where they are trying to eliminate all mammalian predators in order to regenerate the native bush and wildlife. It is one of the few places where you can see skinks and lizards – we had fleeting glimpses as they dashed across our path. We also had to duck and weave as the odd protective nesting seagull dive bombed us! There are more and more “Island” sanctuaries being created by DOC, I think I have already talked about Maungatautari which is not far from us and we visited another called Mount Bruce whilst we were away. 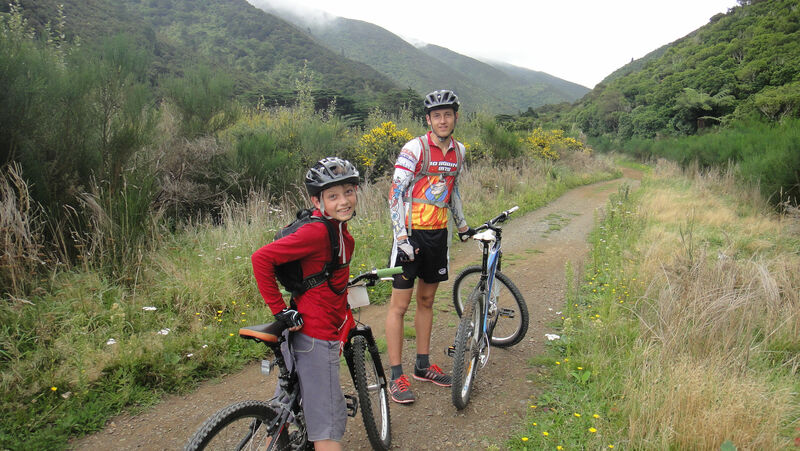 After the beautiful weather on Matiu island the rain came and so looking for wet weather options Terry suggested Mount Bruce. This is a newly developed area with a visitor centre and a Kiwi house. It was fascinating seeing the kiwis interacting and using their long beaks grubbing for food. The Kiwi house is specially adapted to simulate night time so that visitors can see the kiwis as they are nocturnal birds. They have a few that have been reared in captivity and will not be released into the wild, but as they produce young they are carefully nurtured so that they can be released into the wild in the areas that have been made predator free. We also watched the Kaka being fed – these are NZ parrots that have been released into the area, but as they are quite social birds they still come back to the feeding area. They are only given a snack as they get the bulk of their diet for themselves in the wild, but again, it is fascinating watching them scrapping with each other and squawking. Later on when we went for a walk at Waikaremoana we could hear the Kaka above the other birds they have such a distinctive call. The birdsong in the bush was amazing – I think it was the noisiest walk I have done – even Aonghas couldn’t compete!’ We could clearly hear the Tuis and the Bellbirds as well as NZ robins, fantails and a whole host of others that I don’t yet recognise. The sun came out for Christmas day and the planned barbecue went ahead – I still can’t quite get my head around a hot Christmas but we had the full works for Christmas Day – cooked English breakfast, roast lamb, potatoes etc for dinner, the only real difference being the kumara which seems to be served in almost every dish in every restaurant here. Nigel and Blair really struggled whenever we ate out as they use kumara or pumpkin as the basis for nearly all vegetarian dishes – not one of Nigel’s favourites! From there we went inland to another “island” reserve around a lake called Waikaremoana (sea of rippling waters) – this is a huge lake in the Te Urewa National Park. It really is beautiful and well worth the uncomfortable drive to get there and back out again. The main Wairoa to Rotorua State Highway goes through the Park but 90km of it is un sealed and very rutted! The car had a thick coating of red dust all over it by the time we got out! We found a basic DOC campsite (standpipe and Longdrop toilet) but got a tent pitch right next to the lake. Aonghas was keen to get straight in the water but took a while to persuade Lachlan to come in with him – in the end Blair offered them 2 dollars for the first to get in – Aonghas was straight in there but it still took Lachlan an age to submerse himself! It was quite cold – the lake is at 600m – I went in for a morning swim the next day and came out numb! Very refreshing though! We were short of gas so Lachlan and Blair went into the bush to get some firewood just in case. (we’d already checked with the warden that it was okay to have a fire and there were already fireplaces constructed along the lakeside) Lachlan was disappointed that we didn’t need to light the fire that evening – it was also a bit windy so we were reluctant to inconvenience our neighbours. We went to bed after a beautiful clear evening and a dark night sky full of stars, with the Morepork calling to each other to wake the next day to mist and rain! Undeterred we set off on a walk through the bush to a smaller lake called Waikereiti. It was only a short walk but a wet one but the bush sheltered us from the worst of the rain and there was plenty to look at and hear on the way. Definitely a place to go back to in the future as there is plenty of scope for longer walks and overnight tramps. Back to Hamilton for New Year. It was good to touch base and do a bit more unpacking. Fortunately the weather was good again so we managed to dry out the wet tent we had packed away in Waikaremoana. We had a quiet Hogmanay with just the five of us but it was lovely to be at home (and sleeping in our new, very comfortable bed!) I have been struggling with a damaged rotator cuff muscle and sleeping on the hard ground in a tent didn’t do it much good! But a couple of days later we packed up again and drove up to Otauto Bay on the Coromandel coast to stay with Lorraine and Rob on their campsite. A chance for the boys to go fishing – Blair usually fishes for Pike in Scotland so was looking forward to some sea fishing, and he had bought a fishing rod for Aonghas for Christmas so he was keen to try it out! We had four days of beautiful weather after the first night of thunderstorms cleared the air. Unfortunately the fishing wasn’t as productive as we were told it had been the previous week, but we all caught something so were happy. Just being out on the boat early in the morning, the sun shining and the breeze blowing the cobwebs away is wonderful. I could quite happily sit out there all day, rocking on the waves (as long as they aren’t too big!). The boys had great fun playing in the sea – they managed to borrow some kayaks which kept them occupied for hours. Aonghas, of course, was perfectly happy to dig and create fortifications to keep out the sea and then watch them being engulfed before starting all over again! I enjoyed my early morning swims when nobody else was around – it was like having the whole ocean to myself! Before we left to go up the Coromandel we decided we needed a map so that we could get back to one of our favourite past times of poring over the map of the area we were visiting and planning walking routes (and then looking at them afterwards to see where we had been). We had very reluctantly parted with our collection of OS maps when we left the UK, but decided that maps were to be used not stored so gave them to friends we knew would appreciate them. We are quite excited at the prospect of starting a new collection of NZ maps as we visit new places but were disappointed to find that here in NZ that 1:25 000 maps do not exist!! They only have 1:50 000 and there are very few footpaths marked on them. However a lot of the land is open access or is owned/managed by DOC and there are walking route cards available from them (usually at a small cost of $1) which give information about the area and which parts are open access. At the moment most of the walks we have done have been on marked trails but as we get more familiar with the terrain and the environment we will go a bit further afield. Anyway, to get back to the map for the Coromandel – it turned out that we needed TWO maps for the small area we were going to and one of the maps is 90% water!! We decided to do one of the walks marked on the DOC leaflet though not marked on the map – it went up from Fantail Bay and was described as going up to the bushline where their were fantastic views of the Coromandel. After a couple of hours fishing and playing in the sea we headed off through a DOC campsite and into the bush. Following a stream for a while we started to climb up the sides of a gully, the path was marked with coloured tags in the trees but was a narrow track and was quite overgrown with Supplejack and fallen Ponga trees. Blair was up at the front and soon shouted back that he thought we had gone the wrong way. It was clear that we hadn’t but the path was getting very steep and he had reached a point where the path seemed to go downwards before turning back up again. We were in a very steep gully and decided that caution was the better part of valour and turned back. Once back down at stream level we followed the stream along to a very inviting pool – so inviting that the boys and I stripped off and dived in! Cold but very refreshing, we made our way to the waterfall where we let the water pound our backs and floated in the bubbles. We had a lovely time with Lorraine, Rob, Ernie and Marlene who just treated us as part of the family – they have a great setup there as they all prepare a bit of the meals each and bring it all together, eating fresh fish as they catch it. We felt a bit awkward that we didn’t have the wherewithall to contribute as much as we felt we should have but we can hopefully make up for that in the future somehow. I’m sure we will go back there agin and can go better prepared next time. Back to Hamilton again – Blair and I had a bit of a job persuading Nigel to come back before the 8th (his Birthday) as Chris and Brian were coming up from Wellington for a surprise Birthday visit. I also had the job of organising the sleeping arrangements without him suspecting anything! Blair was already in Lachlan’s room and so he was sharing with Aonghas, so we were hoping for good weather so that the boys could sleep in the tent in the garden and I brought the futon in to Aonghas’ room for Chris and Brian. Blair was to take Nigel out of the way for the day so I could do all this! It all worked out well because Chris and Brian arrived while they were out and so he got back to find them there and was genuinely surprised (although we had a scary moment the previous evening when Aonghas nearly gave the game away). It was good to spend more time with Chris and Brian and get to know them better especially since Blair was here as well. But all too soon it was time for them and Blair to go home and the house feels quite empty now we are just four again! Wow, that is a bit of a mammoth blog. Well done if you have got all the way through it! Better stick some photos in now! Well, we are officially in to Daylight saving – the clocks sprang forward this morning and last weekend was the first day of Spring. We went along to Hamilton Gardens where there was a Hispanic theme as the Latin-American contingent of Hamilton celebrated the beginning of Spring. It was very pleasant as the drummers and strummers made their music accompanied by girating, scantily clad, nubile, young ladies! When the boys had had enough we ventured outside for ice creams and a refreshing beer in the sun. The last few weeks at work have been pretty hectic – Nigel is busy writing a major report which has to be submitted this week so he is hard at it every evening collating and interpreting data, and I have been up to my ears preparing students for Practice exams, marking them and now preparing follow up work to make sure they are ready for their main exams in November. But the boys and I now have a two week break so I can perhaps manage to catch the tail I have been chasing! Lachlan gets his pot off tomorrow so he is looking forward to being able to scratch! We have tried to prepare him for the likelihood of him not being able to immediately use his arm but not sure that he has really taken that on board! Hopefully he will be able to get some physio pretty quickly – not sure how it all pans out here but I am sure we will find out soon enough! We might even manage to fit in a day’s skiing at Mt Ruapehu if the doc says Lachlan’s wrist is up to it! I am still buzzing from my first caving trip in NZ! I went away with the Outdoor Ed group for a two day trip based in Waitomo (Maori name meaning Water (wai) Cave (tomo)) at the Hamilton Tomo Club base. They had a session doing some rescue techniques at the Black Water Rafting centre, a session learning SRT, an abseiling session and then a caving trip. It was great to get all my kit out again – that familiar feeling as I donned my gear and had a play on the SRT rig at the centre. Walking into the cave (Gardeners Gut) just felt like coming home – what a wonderful sensation sloshing my way down a stream passage with beautiful banded limestone and a fair bit of flowstone. We climbed up into some dry fossil passage beautifully decorated with straws, helictites, stals and columns (compulsory photograph of the tallest column in North Island but unfortunately not available as we go to press – I’ll add it as soon as I get it from the photographer!) before dropping back down to the stream and heading out. All in good sized walking passage apart from one short section – a large lump of flowstone blocks the way on but for a low, narrow, sloping section called the “Organ Grinder”. It is a similar sort of size to the Cheese Press in Long Churn but probably a bit more technical as it is a dog leg on a slope, so you have to keep your legs and hips up high or you slip nto the narrowest part and get stuck! Most of us slipped through easily with encoura gement and instruction from our guide John, but waiting at the end of the line and watching as everyone else goes through is quite unsettling and our last two students were pretty nervous by the time it was their turn. Both were physically a bit bigger than the rest who were thin, skinny things but they maintained their composure and showed strength of character to get through without too much difficulty. Alan, (aka “Brown Bear”) our second guide. had the most difficulty – whereas John holds the unofficial record of 23 seconds for sliding through, Alan took 15 minutes the last (and only) time he did it! However with John to direct him he beat his previous attempt by 10 minutres and was a happy Bear as he rejoined the group! About a 5 hour trip altogether with a group of 8 novice cavers and a good varied introduction to NZ caves. Bring on the next cave! As I already said we were staying at the Hamilton Tomo Club hut – oh, aren’t caving club huts the same the world over!!? That same earthy smell of damp caving gear, sweaty bodies and stale food and beer! The cliquey photos of the current in-crowd and historic photos of legendary club cavers, the ubiquitous “squeeze machines” and old caving equipment festooning the walls. Difficult though to find out where any of the caves are – there were plenty of surveys and the NZ book of surveys for both North and South Island but no grid references for the entrances and no mention of any locations in the trip logs either, even for newly discovered caves as you would find in UK hut logs (except for top secret digs!!) I sense a challenge coming on! We WILL find some NZ caves! This weekend has been fine and sunny and we have been forced into spending some money on a lawn mower to tame the rapidly sprouting lawn. We also bit the bullet and bought some outdoor furniture – it was still just about warm enough to christen it this evening and eat outside! Let’s hope it will be the first of many meals al fresco! We are now busy planning for Christmas – presents need to be sent soon to arrive home in time and we are starting to plan what to do for the holidays – it does seem strange trying to plan summer activities for Christmas! Looks like we will be down in Wellington and Greytown as soon as school breaks up for NZ family Christmas and we will probably make our way back up the East coast beach hopping after that. Will keep you posted! A bientot!